churches. 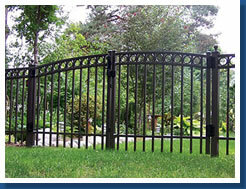 Originally fashioned from wrought iron designed and forged by blacksmiths, today's ornamental fencing is crafted using modern materials and current production techniques. Steel or aluminum components are fabricated into sections using fasteners, locking rods, or welding. Once you determine your requirements, you'll find it's easy to select the appropriate ornamental fence for your application. Ornamental fencing can provide many levels of security for residential, commercial or industrial applications. The right combination of fence height, picket spacing, fence style, and material components can provide the protection you need. Most residential ornamental fences come in heights ranging from 3' to 6' high.